The mystery of hair loss has already been solved. Androgenetic alopecia is an extremely common disorder affecting both men and women. 95% of all hair loss is a result of Androgenetic alopecia or commonly referred to as Male or Female Pattern Baldness. 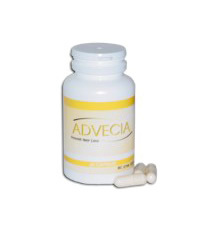 Stop hair loss with Advecia! 1. Provides Essential Nutrients to Scalp- Advecia first works to reverse the effects of the hormones that caused the initial hair loss. By using RNA (ribonucleic acid) nutrients are delivered to the hair follicle, slowly making it stronger and thicker. 2. Revive Hair Follicles- Advecia eliminates clogged hair follicles by dissolving dead skin cells, scalp oil (sebum), and residue from shampooing and may reverse the damage caused by DHT. Then, RNA works with your natural DNA processes to deliver vital nutrients to the follicle. 3. Advecia Nourishes and Stimulates Hair Follicles- Our 100% natural formula provides hair follicles with capsicum, amino acids, and essential minerals to avoid NDF (Nutrient Deficient Follicles). With proper nutrition and increased blood flow to the scalp, dormant follicles can begin producing healthy hair once again. Order Now!